For a while, Adobe has proven that they are a software company not worthy of our trust or respect. And recently they provided us with another reason to question their integrity. This applies mainly to people using the Chrome web browser. For quite some time, Adobe has been trying to sneak unwanted software on to all of our computers. If you go to their website and install Adobe Flash, or Adobe Reader, partway through the installation process you have to be careful to UNcheck a couple of boxes that they have “conveniently” pre-checked for you. If you don’t notice that (as they are hoping you won’t) you’ll end up with extra junk software on your computer. Of course, they make money from that so it doesn’t really matter to them that you didn’t want those programs installed. In addition to this, one of the ways you can keep your computer running fast is to make sure no programs are running in the background other than the ones that NEED to be running all the time (such as your antivirus, your online backup, etc.). When you check that list of auto-startup programs, you’ll see Adobe Reader in the list. No problem, just uncheck it so it doesn’t run all the time, right? That’s fine, until the next time it updates – then it goes right back on the list so it’s running in the background and slowing down your computer. Adobe doesn’t really care what you want. 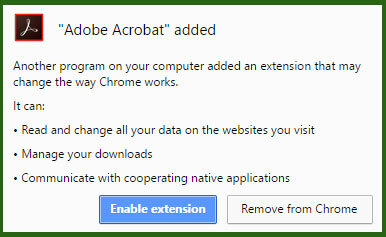 And now their newest scheme…Adobe adds their own browser extension to your Chrome web browser. When you go to Adobe.com, and choose to install the latest version of Adobe Reader, we already know you have to be very careful to UNcheck those checkboxes. Otherwise you’ll end up with stuff from McAfee and other companies installed on your computer. So you go through the whole process, and not a word is said about putting other things on your computer. Of course, Adobe puts the useless “Adobe Reader” icon on the desktop, but that’s easily deleted right after the installation is done. Remember, this is not Adobe telling you about the sneaky installation – it’s Chrome telling you. And they’re warning you that the extension is not only already added, but what the Adobe extension is able to do. This is unbelievable. For 99% of the population, the only reason we want Adobe Reader on our computer at all is to be able to open PDF files. Do you really want this program to be able to “Read and change all your data on the websites you visit”? Not a chance. When you see this alert come up, all you have to do is click on “Remove from Chrome”. Just speaking for myself here, but I personally don’t need or want this extension. When you remove the extension from Chrome, Adobe Reader will still be on your computer, and you’ll still be able to click on PDF files and open and read them. We don’t need Adobe infiltrating Chrome to do those things. And what if you already saw that warning come up, but you clicked “Enable extension”? No problem, you can still get rid of it. Open Chrome, and click the 3 little dots up in the top right corner. In that drop down menu, click on Settings, and in the new window click on Extensions (over on the left). Find the Adobe Reader extension in the list and trash it. Always gotta stay one step ahead of these guys! If you need computer repair in Safety Harbor, Florida or Palm Harbor (or any nearby location) just give me a call. I also do Remote Support repairs for clients all over the U.S. Happy to help if you need me. Thanks for this post, Scott. I didn’t fall for the Adobe trick, but I must have been in a hurry when I updated Evernote, because it had an annoying extension that sneaked in and I didn’t know how to get rid of it. I hadn’t listened for a while. I stll get the feed, but I think I stopped sor the most part a year ago around the time you were teaching people how to stop Microsoft from invading their privacy or taking over their machines. I suggested Linux. 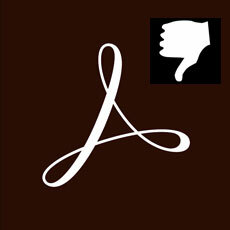 Now it is Adobe that is screwing people. When does it end? I will tell you. It doesn’t. I suggest you and your listeners take to Twitter to let these companies know you know they are lying and that they are scum. They do read those things. But better yet, use alternatives. And Linux keeps geeting better. My family uses Ubuntu 16.04.1, which is a long term support release (LTS) or LinuxMint which is based on Ubuntu.